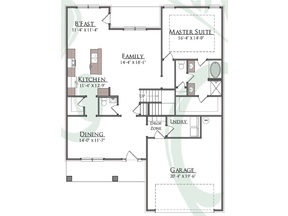 The Emerson plan features an open and spacious first floor with the master suite down. The second floor has 3 bedrooms and an awesome play room. You'll be amazed from the moment you enter the community with the park like entrance. Standard features include; granite counters, back splash, stainless appliances, and pantry in the kitchen. Hardwood floors in the foyer, kitchen & breakfast, gorgeous trim & crown molding, ceramic tile in baths, drop zone, walk in closets & much more! This amazing new community will offer a stocked fishing lake, pool/cabana, playground, breathtaking views and Madison City Schools! Come see why Murphy Homes should be your custom builder. Est. Comp. date is 10/17.